This is the penultimate in a four part series of informative articles on regulations and the regulatory process in the alternative finance market. Previous articles made it to the “Most Read” section of AltFi.com, highlighting the importance of this topic. In the first in this series we put forward the argument that regulation may have actually contributed to the rapid growth of the alternative finance sector, especially in the UK. We also showed you ways to break into this sector without the need to be regulated. Click here to read this article. In the second article, we explored the various regulated alternative finance business models emerging and the key differences in regulation between peer to peer lending and crowdfunding. Click here to read this article. This article specifically focuses on how best to prepare for an FCA application for authorisation. It equally applies to start-ups as well as large multinationals diversifying into this new market. Being pre-emptive will help you anticipate and proactively respond to any questions or objection the FCA could raise before letting you through their gateway. In the next in this series of articles, we focus specifically on questions FCA could raise during their review of the application. Preparation is of paramount importance. A cliché, I know! But seriously, I can’t over emphasise the importance of careful preparation, regardless of whether you are new platform or an existing platform operating under an interim permission. Lack of preparation will result in what the FCA regard as an “incomplete application”. This could set back your launch into this high growth market, by up to one year. A serious setback if you want to launch a business in a market that’s growing on steroids! If you already have interim permission, you can carry on trading while the application is being reviewed. However, you can’t expand your businesses into other areas outside of your interim permission. Firms with an existing FCA authorisation will need to make a “variation of permission” to add the new regulated activity. Diligent preparation, on the other hand, can help to improve systems, process and controls in your business, potentially leading to lower operational losses, higher profitability and better return on capital. It can also yield new insights into how you run your business. The FCA process actually provides a pretty good blueprint for setting up an alternative finance business. FCA explicitly set out criteria against which they will assess and decide on your application. They expect you to demonstrate that you meet these criteria when applying, and will continue to do so on an on-going basis. The criteria are known as “Threshold Conditions”. The word “demonstrate” implies that the application process is certainly not just a form filling exercise, and should never be viewed or approached as such. The business model (i.e. the strategy for doing business) is implemented in a sound and prudent way, taking into account the interest of its customers (and other stakeholders) and the integrity of the wide financial system in the UK. The FCA will also assess key managers running the firm. They will need to be separately approved, and once approved, carry personal liability for negligent breach of regulations. Many underestimate the complexity and extent of the FCA application process. Even if they are certain of what is required, valuable effort and time is often lost because the activities are not sequenced in an orderly fashion. 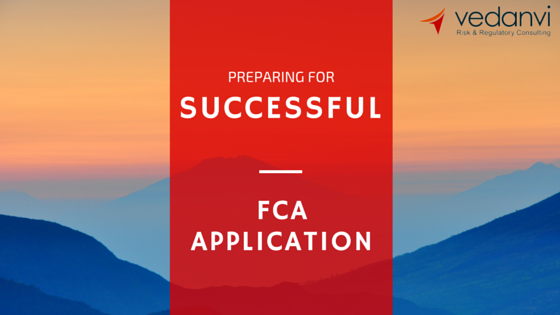 This is an extensive topic, however, I highlight below five key building blocks to ensuring a successful FCA application. This is a crucial step. The chosen permissions dictate the kind of customer you are allowed to deal with, the type of products you can provide to them, the rules you need to comply with and management that need to be approved by the FCA. Getting this wrong could be catastrophic. It could unnecessarily restrict your business, or worse, you could end up breaching regulations inadvertently because your permissions do not cover certain activities within your business. Start by making a list of everything that you are doing or plan to do in your alternative finance business and compare them against the list of regulated activities set out in the Regulated Activities Order (part of the Financial Services and Markets Act). Be prepared to defend your position as the FCA will question the validity of the permissions you have applied for, against your business plans. Knowledge of all the individual regulations applying to your business is the only certain way to ensure compliance on an on-going basis. There is no easy way, but to painstakingly go through thousands of lines of the FCA handbook and extract every single rule and guidance applicable to your business. Then document, in a detailed manner, the specific actions the firm and individual employees will take to comply with each rule. Make a list of supporting documents against each rule. This could include policies, process maps, checklist, logs & registers, forms, declaration statements, committee terms of reference, etc. For each regulatory requirement, decide who will take responsible and be accountable for compliance. Document how compliance will be monitored and how frequently this monitoring will take place. By going through this you will have developed a compliance manual and compliance monitoring programme. Both documents form an integral part of the FCA application pack. If done rigorously, this process will help to form a firm foundation for on-going compliance. Download the FCA application pack and guidance notes (for a paper based application) or log into the FCA Connect system (for electronic applications) to access the application form. A review of the form will help you understand what the FCA is looking for and documents they will require in support of the application. A list of tasks and owner for each task. A regulatory business plan that goes beyond a traditional business plan. This plan includes details on how your business will run on a day to day basis and how you will ensure compliance. Remember first impressions are lasting impressions, because the regulatory business plan will form their impressions of your business. 12 Month projected financial statements, including balance sheet, profit and loss and cash flow statements. You will also need to calculate the financial resource requirements and capital adequacy needed to sustain the business. This may well involve some fundraising activity before you are ready to make the application. Email me at fca.application@vedanvi.com for a list of supporting documents to include in the FCA application. Regarding the second list, turn the task list into a project plan and impose a disciplined project management approach to the FCA application process. The regulatory permissions you are applying for will dictate the “controlled functions” you will require. Control functions are key departments or sections of the business, playing a vital role in ensuring on-going compliance. Managers leading these functions will have to be independently assessed and approved by the FCA as “approved persons”. Each controlled function holder will have to complete a separate application form. Being an approved person carry significant responsibility and personal liability. They will have to satisfy the FCA that they have adequate knowledge, experience and competence to carry out their responsibilities and that they are fit and proper people. Because alternative finance is an emerging area, it’s not uncommon to face difficulty in recruiting personnel with the required level of skills and experience. In this case, an intensive training plan and external or internal support could suffice, or the controlled function could be outsourced until a permanent hire can be made. There is a good chance that prior to approval, controlled function holders will be called up by the FCA for an in-depth interview. It’s a good idea to start training them early in the process and go through an equally intensive mock interview before attending their interview. The FCA application will have many moving parts that will need to align in such a way that a clear and coherent story is put forward to them. So for example, the product roll out strategy highlighted in the business plan will need to tie up with revenue projections in the financial statements and this in turn will need to tie up with procedures laid out in the compliance manual for product approval. Ensure that you develop a comprehensive review and sign off process not only for the application, but more widely when developing the risk management and compliance framework. Apart from playing a quality control role, the review process will help to embed a culture of compliance as it creates a common pool of knowledge, as staff review each other’s work. Many firms will use external and independent reviewers who can bring their experience and insights to the process, which could help the team unearth new issues and/or gaps. The external review could enhancing the overall quality of the application and potentially limit the number of questions FCA come back with as part of their review process. The final article in this series will specifically deal with questions the FCA are likely to put forward to firms during their review process. How you respond to them could make the difference between being authorised or rejected.